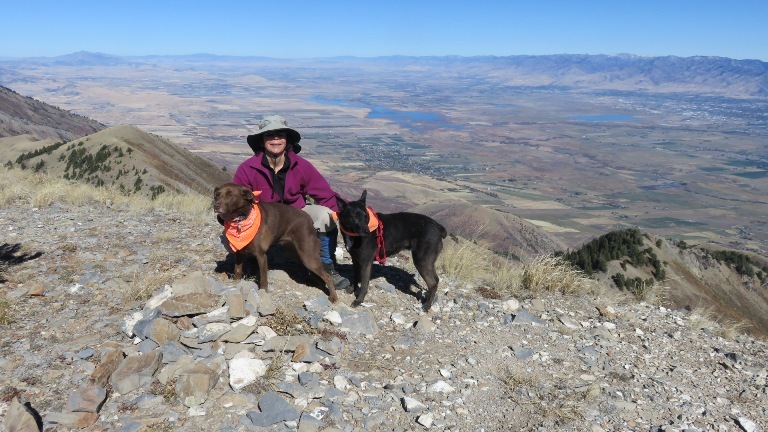 Four hikers and two dogs did a traverse of the Wellsville Mountains from the Rattlesnake trailhead in Sardine Canyon to the Deep Canyon trailhead west of Mendon. We started from Caffe Ibis in Logan at 7:00 AM, drove to the Deep Canyon trailhead and left one car, and then drove to the Rattlesnake trailhead, where we started hiking at 8:00. The predicted low for Saturday night was 20°F, and it had snowed a bit on Friday night and into Saturday morning, so we were expecting possibly wintry conditions. However, it didn’t seem to be as cold as predicted. By the time we had been hiking around an hour, it was possible to shed layers. The day was perfectly clear, and the wind was not nearly as stiff as we knew it could be, even on the ridge. We took our time going up the steep Rattlesnake trail. Most of the maples had lost their leaves, and since there were many on the ground that were still green, it appeared that they had fallen when the weather turned cold so suddenly a few weeks ago, before they had time to turn color. There had been some trail work about midway up this trail, where we were happy to find that a thicket of mountain ash that had once overgrown the trail to the point of making it a true obstacle course had been cut back. There was still plenty of brush to battle higher up, however. We reached the saddle between Box Elder Peak (which was evidently renamed Bob Stewart Peak in 1996) and the Wellsville Cone around noon. 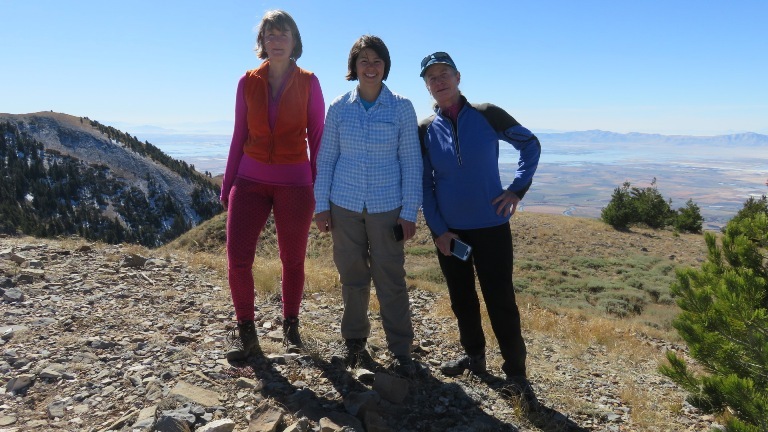 Stephanie and Catherine both went to the rock cairn on Box Elder while Susan and Laurel waited on the saddle. Then we all resumed the trek to the Wellsville Cone, stopping to have lunch on the north side before we visited the summit. There were some new signs at various places along the ridge, one clarifying the trail near the Cone, one pointing to a spring downslope to the east farther along the ridge, and one at Stewart Pass. The temperature and wind stayed pleasant for the duration. We arrived at the top of Deep Canyon at about 3:15 and made it to the car at 4:50. After driving back to the car at Rattlesnake, we made our way back to Logan and were home before 6:00 PM. Thanks to Laurel for the narrative, photos and carrying the GPS (Dave W. extracted the GPS data). 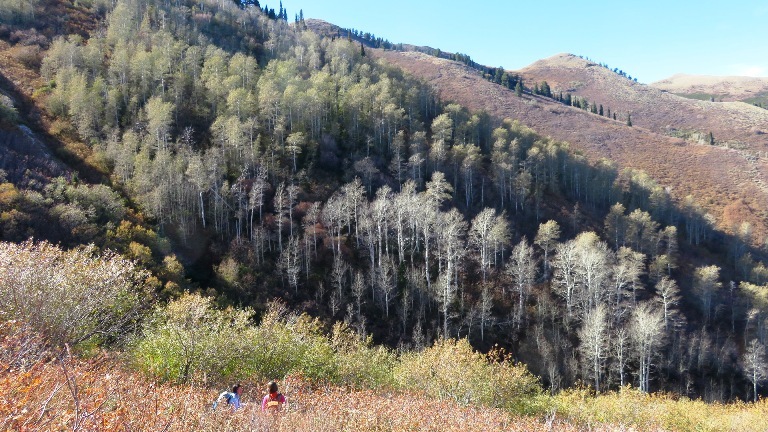 Editor's Note: In the Cache Trails book, author Jim Sinclair noted that "Box Elder Peak" was incorrectly renamed "Bob Stewart Peak" on the 1998 USGS topographic map. Other maps show the correct name.